Update 10:25 UTC : As could be expected a lot of aftershocks in the area. The strongest one so far was a M4.9 at 02:10:52 local time. Summary January 31 - 00:15/02:45 UTC : Unfortunately we have to report that a 50 year old woman from Copiapo (Patricia Aguilar) died of a heart attack. ER calls this a secondary fatality so remains an Orange event. - Communications and power have been most affected in Huasco and Tierra Amarilla with around 18000 homes having no power for a few hours. Carrizal Bajo would have felt the earthquake extremely strongly and we are still waiting for damage reports from this harbour town of around 1000 people about 15-20km from the epicenter. - A task force is currently assessing the situation in Vallenar, but the damage can after be called minor (some partly collapsed walls, landslides (picture), broken and collapsed gutters etc. - Road damage via ground movement has added to the difficulties of this taskforce work. Update 22:21 UTC : People living in the Atacama province will have to be conditioned to live for a long time with aftershocks. The area had a lot of weak to moderate earthquakes since a long time and today's earthquake will only add to this. Update 21:58 UTC : Video of the shaking in La Serena, 169 km from the epicenter. MMI shaking in La Serena was IV (light shaking). An ONEMI employee stated that the shaking lasted in between 25 and 30 seconds, which is normal for such a strong earthquake. Update 21:49 UTC : Chile is one of the best prepared countries in the world against earthquakes. Most of the buildings have been build earthquake resistant and the authorities have a very good communication system by means of ONEMI. No more news at the moment. We will continue scanning the local authorities and local press and will report to our readers if we find some additional information. Update 21:28 UTC : No injuries reported at the time, only panicked people in hospitals. Update 21:27 UTC : After the first frightening reactions in Vallenar the situation is clearing and it looks after all that there will be NO general serious damage, which we like a lot. The area has still problems with the cellular network. We are tired of repeating that the solution is simple. Block all voice traffic in the earthquake zone and allow only conversations with the rescue and relief services. Let people communicate by TEXT (SMS) and the networks will hold. Update 21:19 UTC : USGS has increased the Magnitude from M6.7 to M6.8 at the same depth of 47.5 km. The area has regular strong earthquakes due to the subduction of the Nazca plate below the South American plate. The Nazca plate moves to the east and hangs here and there. When the stress gets too big, the earthquakes occur. Update 21:14 UTC : Although NO tsunami alert was called, people have auto-evacuated the beaches which are currently completely deserted. The epicenter area itself is almost unpopulated with only a few scattered houses in Carrizal Alto. 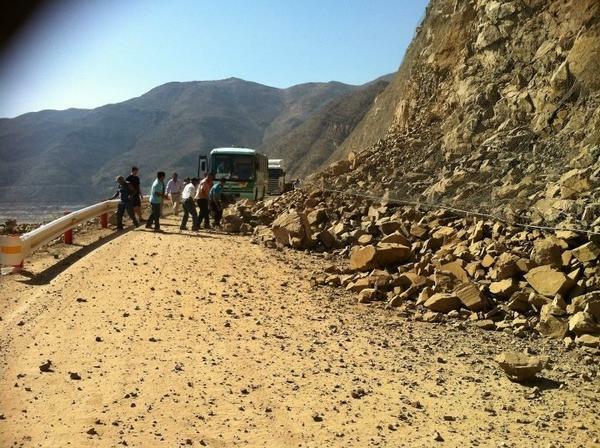 A landslide on the north side of Vallenar made the road to be closed. Update 21:10 UTC : At least 2 well felt aftershocks on the region. Minor landslides are reported on Vallenar. Calm is slowly restoring. Vallenar has a population in between 48,000 and 70,000 people depending on the source. Update 21:04 UTC : Collapsed walls are not yet confirmed (dangerous for injuries) but people in Vallenar are mentioning a lot of broken windows. Vallenar is still 44 km from the epicenter, but at the depth of +40 km the difference in shaking will be limited. Update 20:51 UTC : The government is calling for calm, radio Bio Bio is saying there was mass hysteria in Vallenar. Update 20:50 UTC : Electricity went down on some parts of Copiapo. The earthquake was strong and long. On Vallenar there are reports of a lot of windows broken, cracks and collapsed walls. A lot of panic in there, people crying on the streets. Update 20:43 UTC : In a local TV studio a windows rattle and a big one broke , but didn't made injuries. There are problems with communications with mobile phones. In the third region of Chile there are reports of collapsed walls. Electricity went down on some parts of Copiapo. This looks like a grim earthquake, worse than other intermediate depth earthquakes. NO damage so far (far too early) but Telecommunications are down in the area. Update 20:29 UTC : Universidad de Chile Santiago preliminary data are reporting M6.4 at a depth of 43 km. Damage cannot be excluded completely at this point. The earthquake epicenter is below land, so a tsunami risk can be excluded immediately. Epicenter in between Vallenar and Copiapo. Copiapo - Cayeron elementos de estantería. Aparecieron grietas en las paredes. Por momentos fue difícil mantener el equilibrio. Recoleta, Santiago, Chile - I live on the 21st floor, felt the building bob back and forth gently for about 10 seconds. Santiago, Chile - At the airport on January 30, 2013. The ground shook, vibrated like a large jet was taxiing by us. The glass in the windows was pulsing.